For our tenth year of teaching, Amy and I have decided that we are going to spend more time focusing on our creativity. We are going to simplify our lives so that we have clarity about what we truly value. As we get older, we both notice that the material things are less important to us than they used to be. We need to get rid of the literal and metaphorical clutter so that we can discover and display our true passions. In 2003, Amy and I were walking down a street in Tucson with our Writing Project friend Jan Sabin. We were there to attend a National Writing Project Rural Sites Retreat with the theme “Blending Voice and Place” […hmmm…an influence on our blog title?…]. Keynote speaker Tom Romano inspired us with an emotional multi-genre presentation about his wife’s battle with cancer. No PowerPoints or droning on … just a lot of passion and truth. We had never watched such a creative presentation. To us, Tom was and is a teacher-writer guru. Also, this was our first Writing Project conference. We were a little star struck by the whole experience. A few years ago, Amy and I took a poetry class at NMU where we met a friend, Matt Maki. This past year, we went to Matt’s poetry reading “The Jesus Year” at an amazing place in west Ishpeming called “The Joy Center.” We admired the raw honesty of Matt’s poetry and fell in love with the spirit of The Joy Center. 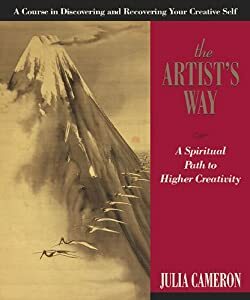 When Matt recently announced that he would be leading a book study there on The Artist’s Way: A Spiritual Path to Higher Creativity by Julia Cameron, Amy asked me if I would join her. Leap we will. One of my dreams is to write a book […even while putting those words to paper, my inner critic whispers, “So cliché, everyone wants to write a book.”…]. I’ve thought about it for years, but I do not even have a first page. I’ve done lots of other writing, some of it published but most of it written in draft form in notebooks scattered around my house. I hope that I will get past this creative block by nurturing my inner artist. Meanwhile, I need to shush the critic. I know, too, that one of Amy’s dreams is to publish her poetry. Perhaps this class will quiet her inner censor and provide her with the encouragement to send out those poems…and, believe me, she pens fabulous poetry in her notebooks! Let the gush begin. I feel comfortable sharing my thoughts with Matt and others in the group, too, because Matt isn’t afraid to tell it like it is. The truth will be welcomed. On Facebook, Matt has “TMI Tuesdays” where he posts thoughts from the day that most people wouldn’t reveal. Matt’s had his share of criticism for this, but I hope he doesn’t change who he is. Nothing grabs the interest of a reader more than the truth. The second tool is the artist date. Once a week, we are to set aside about a two-hour block to nurture our creative consciousness. This one will be more difficult for me. I’m not in the habit of setting aside much time for myself. This week, for example, I thought about participating in an Introduction to Jewelry Making Workshop at Bella Beads on Wednesday night. Participants make a necklace to keep. This sounds great; however, then I remembered that I told my daughter I would take her to a hip-hop class at the same time. I’m sure all parents run into these time conflicts. I do know, though, that I can’t pick the kids over me every time. There needs to be a balance. Amy and I believe that taking the time to nurture our creative sides also will help us engage our students. While reading blogs from our National Writing Project colleagues, we drop in on many conversations about nurturing the spirit of “make” in the classroom. Writing teachers around the nation engage students by having them “make” or “play” or “experiment” in the classroom, and then write about their processes. While Amy and I believe in this, we’ve experienced raised eyebrows from a couple of teachers and parents when we’ve introduced creative projects. The comment is that “they’re just having fun, not learning.” We know, of course, that we need to focus on academics but we also know that tapping into their creativity can help students engage with the material and retain it longer. We’re curious how other teachers balance these scales. We are ready to take that leap and to see what we can create. This entry was posted in Reading, Teaching, Travel, Writing, Writing Project and tagged Arts, Facebook, Julia Cameron, National Writing Project, Poetry, The Artist's Way, Tom Romano, Walt Whitman, Writer, Writers Resources. Bookmark the permalink. I am so enjoying keeping in touch with you by reading your blogs. What a great idea! 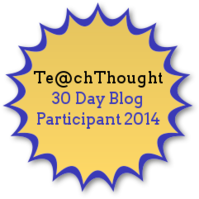 You are both growing in so many ways as you explore writing, teaching, cooking, and technology. I loved the pictures of you, Jan, and Jon. I miss all of you! thanks, material is really informative and interesting.